Flares like this one at a new oil well near Douglas are raising concerns amongst area residents. INTRO: This spring, an oil rig blew out near Douglas. Natural gas spewed into the air, and residents from a nearby neighborhood were evacuated for several days. Since the blowout, Chesapeake Energy has drilled several new wells around that same neighborhood, and residents have new concerns. Wyoming Public Radio’s Willow Belden reports. BELDEN: The neighborhood in question is a cluster of modest homes, several miles northeast of Douglas. This summer, a ring of new oil wells sprang up around the community. Some are right across the street from peoples’ houses. And each well pad has a tall smoke stack with flames coming out the top. Those are flares. They’re used to burn off the natural gas that comes up as a byproduct with the oil. Flares are a normal part of oil production. But some residents say they’re causing problems. Janice Switzer lives less than half a mile away from one new well. She has a big vegetable garden, where she grows everything from corn to kohlrabi. But now, many of her plants are brown and shriveled. JANICE SWITZER: This started dying in July, and it wasn’t due to the heat, because I’ve got a ground-soaking system and it was watered every day. BELDEN: Switzer suspected that the dying plants might have something to do with the new oil wells, so she called the Department of Environmental Quality. They sent someone out to look at the garden. BELDEN: As in, catch the most emissions from the flares. Switzer says that scared her. SWITZER: If it kills my plants in the middle of the summer, it makes me wonder what it’s doing to me. BELDEN: Switzer says she’s been waking up with headaches every day since the flaring began. She isn’t the only resident who’s concerned. Her neighbors are worried about black smoke they often see pouring out of the flare tubes. They’re worried because they’ve also watched their gardens and trees die. One resident even says he smells gas in his drinking water. Several community members have complained to the DEQ, to the Wyoming Oil and Gas Conservation Commission, and to Chesapeake Energy. But it’s not clear who’s responsible for addressing their concerns. Here’s Chesapeake Energy spokeswoman Kelsey Campbell. KELSEY CAMPBELL: We fully adhere to all local, state and federal regulations on flaring and emissions. And if any residents feel that this is not occurring, they should contact the state’s regulators and ask the regulators to address any concerns they may have. BELDEN: So I contacted the regulators. I started with DEQ, and I asked Steve Dietrich, the head of the Air Quality Division, about the black smoke and the gardens dying back. STEVE DIETRICH: That would be a question for the oil and gas commission. BELDEN: So I called the Oil and Gas Commission and asked Interim Supervisor Bob King the same questions. BOB KING: If the flare were emitting emissions that were unacceptable, it would be the DEQ’s issue, more than the Oil and Gas Commission. BELDEN: Residents say they’re frustrated that regulators keep passing the buck. But DEQ and the Oil and Gas Commission say there’s no cause for alarm. They say Chesapeake isn’t violating any rules. And Steve Dietrich with DEQ says flaring is actually a good thing. DIETRICH: A flare, such as the ones we’re talking about today, have always been considered a form of air pollution control. BELDEN: Dietrich says you have to get rid of the gas that comes up when you’re extracting oil, and flaring is better than simply venting the gases into the atmosphere, because it destroys many harmful pollutants. In other words, flaring shouldn’t be bad for your health. MIRIAM ROTKIN-ELLMAN: When you flare, you burn the gases that are coming out of the well, and you turn it from a gas into a particulate. And those particulates can get into peoples’ lungs and can get into peoples’ blood stream. BELDEN: That’s Miriam Rotkin-Ellman. 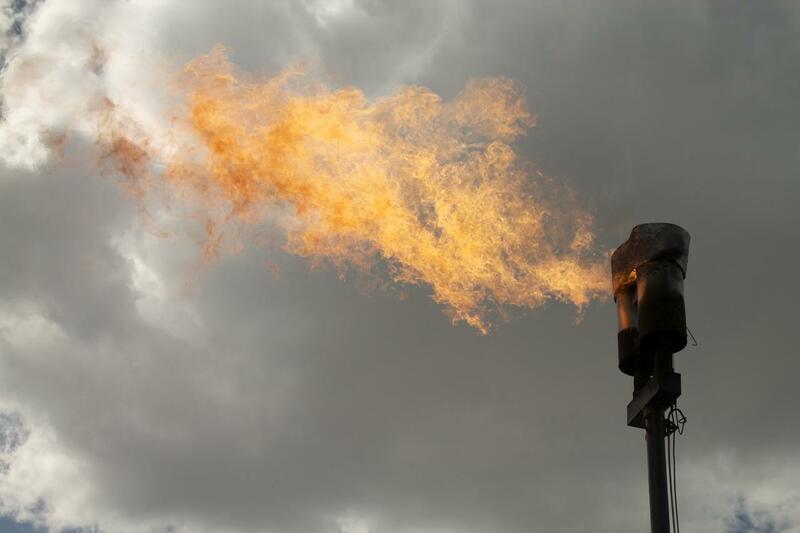 She’s a public health scientist with the Natural Resources Defense Council, and she says even brief exposure to particulates from flaring can cause respiratory and cardiovascular problems, and even premature death. ROTKIN-ELLMAN: It’s definitely a problem that is worse, the closer you live to these types of facilities. Particulate matter levels do fall off. So I’m particularly worried about people who live close by to where there’s a lot of flaring. BELDEN: In other words, people like Janice Switzer and her neighbors. It’s hard to know exactly how worried they should be, because DEQ does not monitor air quality in Converse County. The agency says they may add a monitor in the future, but despite the sudden increase in wells, it probably wouldn’t happen until at least 2015. Of course, there are alternatives to flaring. You can capture and store the gas. And if you have a pipeline, you can transport it and sell it. But Chesapeake doesn’t have a pipeline in that area yet. So they’ve gotten permission to keep flaring for six months, while they get more infrastructure set up. Some residents, like Joe Ramirez, who used to work in the oil industry, say six months is too long. JOE RAMIREZ: If they don’t have a way to take care of the gas, then knock off your damn drilling until you can take care of it, as opposed to flaring it like that. BELDEN: But instead of putting a halt on drilling, more wells are going in. The Oil and Gas Commission has issued hundreds of new permits to drill in Converse County and expects to see even more activity in the future. And that concerns resident Kristi Mogen. KRISTI MOGEN: That’s a lot of traffic, and that’s a lot of flares. BELDEN: After the well blowout this spring, soil testing showed diesel-range organics on Mogen’s property. And her kids had bloody noses for a month. She says she’s worried that more health problems could show up as a result of the new drilling. She’d like to move away, but her husband Pete isn’t sure they can. PETE MOGEN: I mean, how can we put this place up for sale, knowing that the soil has been contaminated? BELDEN: Kristi Mogen says she’s scared. And she wants some assurance that regulators are taking the community’s concerns seriously. MOGEN: We don’t want to be another Pinedale or Pavillion. BELDEN: For Wyoming Public Radio, I’m Willow Belden.